Jim Klopman is an innovator in other industries, Jim says that his brain damage, ADHD, and Dyslexia are blessings that free his mind to see tech advances before others. Jim developed the SlackBow Balanced Training System to improve and maintain his own athletic performance. Jim believes a fit human balance system is the key to maintaining physical and psychological success in all areas of life. In this conversation, you will hear Jim explain the importance of balance and the human balance system. He explains how, through technology and other modern ways of living, we have diminished balance abilities. Jim shares how strengthening the human balance system, you can calm your whole system and how this can help you in life, and specifically with ADHD. [06:17] – Jim explains the SlackBow Balanced Training System. [07:46] – Jim talks about the human balance system and the sensors that make up this system. [08:48] – Jim sees a correlation between extreme sports and ADD. He shares his opinion on why this is the case. [09:43] – We talk about balance and counter-balance. [14:06] – Jim explains why he calls it “the balance system” and explains why this is a set of systems. [18:12] – Jim shares his background, which includes brain injury, dyslexia, and ADHD. He also describes his diagnosis experience. 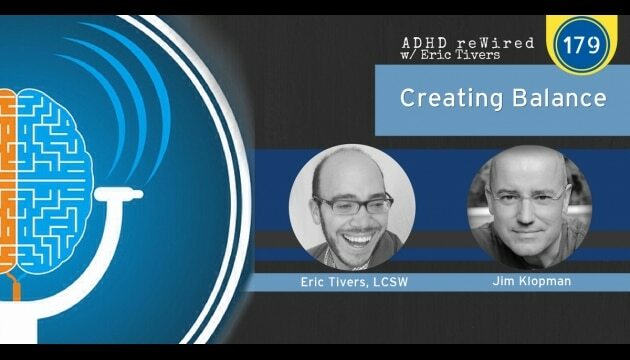 [24:03] – Jim talks about his ADHD journey after his diagnosis. [32:27] – Jim explains the brain-body connection and concussions. [35:31] – Jim provides some examples of balance training that you can do at home. [40:40] – Jim explains why balance training can help in life and with ADHD. [47:22] – Jim shares how to calm your whole system. [49:05] – We discuss vision, peripheral vision, and visual overstimulation. [54:24] – I talk about my dad’s balance issues. Jim provides me with some ideas that could help him. [1:00:06] – Jim explains how a nerve stimulator can help with balance. [1:05:45] – Jim talks about what he is working on with his business.